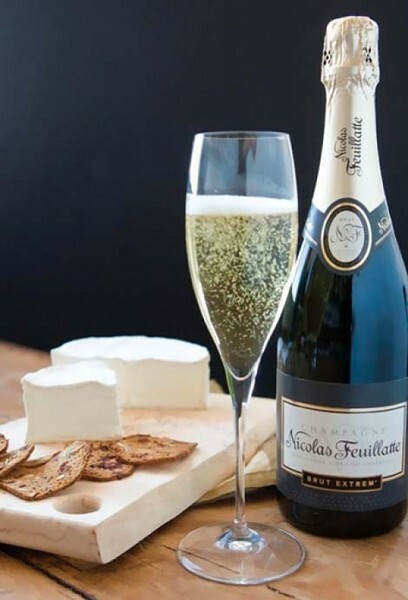 Getting festive with sparkling wines and cheeses. Imagine a holiday get-together that is always elegant and relatively stress-free, one that can be meticulously choreographed or, on the other hand, quite impromptu. On top of all that, it can done expensively or in a budget-friendly manner. This may seem impossible, but not so if you consider throwing a sparkling wine & cheese party. After years of hosting wine-and-cheese events with a local specialty cheesemonger, we both came to agree that white wine is more at home with a varied cheese platter. I realize there are some fantastic red wines that call out for specific cheeses, but on the whole, the tannins in red wines can overwhelm many cheeses. A white wine with crisp acidity cuts through the saltiness of the cheese, and this same saltiness can bring out the fruit in the wine. A sparkling wine is even crisper than most still wine, and the effervescent texture makes a party happen. Think about it: Just putting out some quality cheeses and popping a few bottles of bubbly result in festive elegance with very little work. You can choose specific sparkling wines that vary in style and pair them with specific cheeses, and it will be the event of the season. Or, you can just casually grab a bunch of bottles and few cheeses at random, and it will still be memorable and fun. Focusing on true Champagne is indeed “big ticket.” But Spanish Cava, Italian Prosecco, and domestic sparklers can make a bubbly party much more friendly on the pocketbook. You can even ask that each guest bring a sparkling wine and/or a cheese to the party—talk about fun, easy and extremely affordable! Champagne is the hallmark of highquality sparkling wine. To put it in extremely basic terms, it is a still wine given the addition of more sugar and yeast, which causes it to undergo a second fermentation within the confines of the bottle from which you are pouring. With no escape route for the resultant carbon dioxide, you get bubbles in the bottle—tightly woven high-quality bubbles that resemble tiny beads. The different blends, designations, and levels of sweetness from France’s Champagne region (and elsewhere) are a subject for another time. But mixing it up between Brut, Blanc de Blancs, Blanc de Noirs, and Brut Ros%uFFFD is a lot of fun. If you choose not to go with Champagne, select wines that employ the same method as in Champagne, most often denoted as Methode Champenoise, Methode Traditionelle, and Methode Classique, or translatable versions thereof. Spanish Cava, the more affordable option, is indeed made from this method. Domestic sparkling wines should also be labeled as such. Italian Prosecco, on the other hand, undergoes its second fermentation in large tanks and then is bottled. This results in larger bubbles, but this wine is very versatile and great for guests who do not care for the overt spritzy attack that other sparkling wines unleash. Gus Magann is a partner at Vine Lore, a Utah wine brokerage.